If you’re following Iowa Gun Owners on Facebook you’ll know that we’ve been hinting at a massive new firearms giveaway for some time now. Today we’re pleased to announce the biggest giveaway that we’ve done – a Savage 110BA in .338 Lapua! The .338 Lapua has an effective range of 1 MILE – although longer shots have been documented! This beautiful bolt action rifle features a fully adjustable AccuStock, 5 round detachable box magazine, and a 26” carbon steel barrel, all overlaid in a matte black finish. It’s simply incredible. Every gun owner knows that a gun like this needs a scope to complete it. That’s why we’re also giving away a Vortex Viper 6-24×50 scope as well. The body of the Vortex Viper scope is machined from a single solid block of aircraft-grade 6061-T6 aluminum and it has ¼ MOA adjustments! This combo is valued at over $3,000 – but you can win it absolutely FREE from Iowa Gun Owners by entering your information below. Iowa Gun Owners is engaged in a battle to stop gun-grabbers in the General Assembly, and we want you to be involved in this fight! Whether it was massive anti-gun expansions of code under the guise of “mental health,” bans on magazines that hold more than 10 rounds, or Michael Bloomberg’s Universal Registration legislation – last year saw them all in the Iowa legislature! Now, as we look to the future, Iowa Gun Owners wants to greatly expand our grassroots army so that more and more of you and your friends can be mobilized to these fights. That’s why I hope you’ll take a moment to sign up to win this wonderful rifle, and get involved in the fight for the 2nd Amendment in Iowa at the same time. We are very happy to be partnering with The 2nd Amendment Shop out of Lohrville, IA in this giveaway. Owned and operated by IGO member Jim Hirschberg – The 2nd Amendment Shop would be a great place to go and purchase your next firearm. You can follow The 2nd Amendment Shop on Facebook here. Make sure to “Like” their page. This giveaway will end at noon on Election Day, the 4th of November. So no matter what happens that night, whichever party ends up controlling the US Senate or the legislature here in Iowa, one Iowan is going to have a really good day! Don’t delay – sign up IMMEDIATELY for your chance to win a Savage 110BA in .338 Lapua with a Vortex Viper scope. This package is valued in excess of $3,000 – but can be yours absolutely free! Please take a moment to share this email with your friends! P.S. Iowa Gun Owners is launching our most incredible gun giveaway ever! 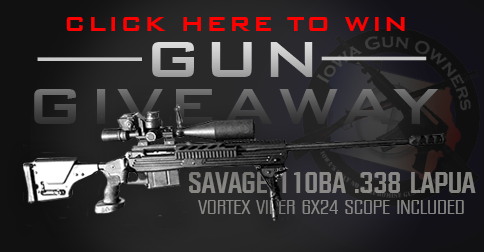 Sign up today for your chance to win a Savage 110BA in .338 Lapua. This incredible rifle has an effective range of over a MILE! To complete this wonderful rifle, we’re also giving away a top-of- the-line scope. This Vortex Viper 6-24×50 scope is machined from a single solid block of aircraft-grade 6061-T6 aluminum and it has ¼ MOA adjustments! Combined, this package is worth over $3,000 but you can sign up to win it absolutely free. Simply click on the sign up box below, enter your information, and we’ll be sure to let you know who wins this awesome rifle when the drawing concludes on Election Day, the 4th of November. Enter to Win a Savage 110BA in .338 Lapua from Iowa Gun Owners in conjunction with our friends at The 2nd Amendment Shop, Lohrville, IA. Drawing will take place on Tuesday, November 4, 2014. Void where prohibited. Winner must be legally eligible to possess firearms. Winner will be notified via email and/or phone. Winner will have 3 days to respond once contacted before we move to an alternate winner. Winners agrees to have his/her name and image used for promotional purposes by IGO and to personally come to The 2nd Amendment Shop to take possession of the firearm. Bruce Braley v Joni Ernst on Your Gun Rights! Gun Owners: Can You Help Us Fight for Your Rights?